Hey guys, I guess most of you have already seen the film but I’ll post it here just in case some of you don’t have the link. 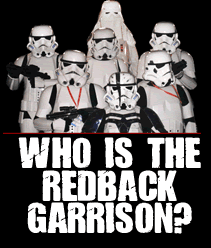 This is the doco I shot about Apok and the 501st/Redbacks, during the dreamworld weekend. Have a look and i’m sure you will be there somewhere! So far it has recieved positive reviews, and we got a 90/100 as our mark for the production so really happy! Thanks again for everything guys, without you… No doco! And specially again to Adam, it was an honor to document such an energetic, passionate and crazy character. This entry was posted on Sunday, June 16th, 2013 at 9:11 pm	and is filed under Uncategorized. You can follow any responses to this entry through the RSS 2.0 feed. Both comments and pings are currently closed.